Google may have changed how we do business, but they’re out to disrupt another office staple, too: the on-campus lunch. In 2015, the company announced their partnership with The Whole Cart, a catering service that will bring 20 cool food trucks to Menlo Park. Brimming with innovative takes on street food and farm-fresh ingredients, food trucks do more for office culture than infuse a little fun (though they certainly do that, too). Hiring local food trucks can reinforce company values about health and wellness, reward employees for a job well done, and refuel your running list of office entertainment ideas to boot. At New York Delhi, one of The Whole Cart’s offerings for Google, Kosher deli staples by way of India don’t sound crazy at all. Try their Corned Beef Biryani or a Reuben Mehtas: that’s seared lamb and cilantro raita on—what else?—a warm Challah bun. Follow the scent of rising dough, warm herbs, and fresh tomato sauce to Del Popolo, where woodfired pizza will knock $1 slices right out of your head. (Sorry, New Yorkers.) Their light, crispy crusts and classic margherita sauce give Neopolitan fare new life in San Francisco. No outdoor Boston event is complete without a Bon Me sighting. Brave the lines for a taste of their housemade pork ramen or classic bahn mi with pickled carrots, daikon, and the real kicker—pork pate. With menu offerings like scallion pancake sandwiches, pierogi dumplings, and charred cabbage salad, it’s no wonder this Boston staple wins oodles of awards. For a fresh take on Chinese food—or a company party—Mei Mei’s Street Kitchen does the trick. Charlotte’s first food truck, Roaming Fork, serves up gourmet grilled cheese with tender smoked pork, killer fish tacos, and the ultimate people pleaser: pumpkin mac and cheese. According to owner Jenn Sibrava, their fresh takes on comfort food are thanks to an ever-changing menu. Austin’s food truck scene is second to none, and Patrizi’s is a welcome addition. The Italian joint boasts classics like Cacio e Pepe along with original dishes packed with flavor—basil and arugula pesto, crushed red pepper, and lemon zest. 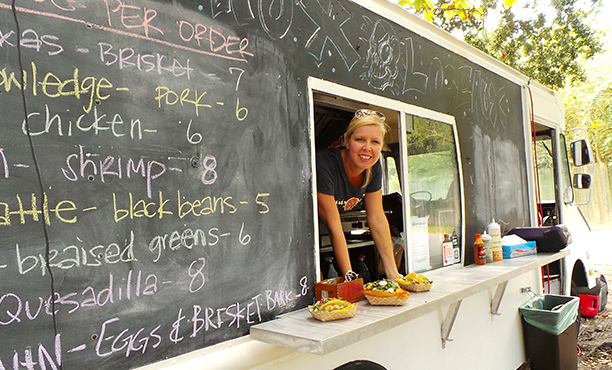 Make room on your list of company party entertainment ideas for cool food trucks like this one. Melange Creperie serves Houston delicious variations on traditional Parisian street food, like their triple egg crepe with greens and smoked gouda. Check their social media channels for daily updates on this roving creperie. 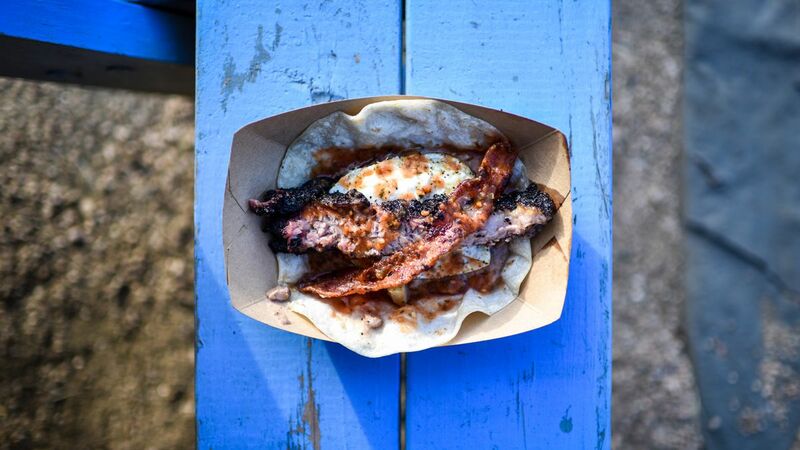 Oh My Gogi marries traditional Korean with Mexican fare for the perfect Houston street food. Set your sights on dishes like Kimchi Quesadillas and Korean Beef Tacos for a flavorful lunch that packs a bellyful of heat. Need to refresh your company party entertainment ideas? Take your office fiesta to the streets! With an innovative take on whole grain bowls, Pico House delivers the goods in Los Angeles, from short ribs and meatballs to gochujang braised pork and harissa roasted lamb. Specialty food trucks like Kogi BBQ bring the party along for the ride. Fan favorites like the spicy Kogi Kimchi Quesadilla or the Calamari Taco brighten up any cubicle lunch or after-hours soirée. With the best tacos al pastor and mouthwatering tortas, Leo’s Tacos Truck ensures West Angelenos never have to pack an uninspiring brown bag lunch again. Follow them on social media to track this gem down. Warm spices like turmeric, saffron, and cardamom are the signature scents wafting from Sajj Mediterranean. Customer faves like pomegranate chicken, steak shwarma, and homemade falafel make this food truck one of San Francisco’s best. New Orleans has a small but burgeoning food truck scene, according to Eater, and Taceaux Loceaux is one of the Big Easy’s best. Customers come from all over to nosh on chorizo tacos with scrambled eggs and crema or brisket tacos with spicy radish and cool cabbage. Dumplings and steamed buns on the go? Portland natives can’t afford to miss Bao Bao, one of Portland’s many cool food trucks. Look out for their Shrimp Wonton Noodle Soup and Bulgogi Beef dumplings. Ready to see what’s beyond your cubicle? Check out these work-friendly food trends.